Lawnscaping FIT Team APRIL Blog Hop! 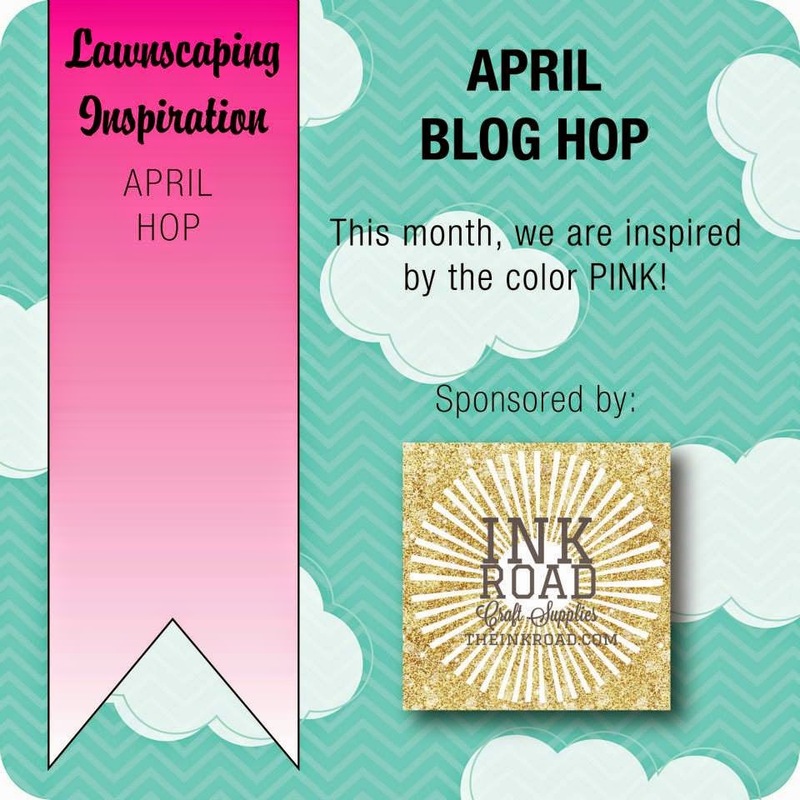 Welcome to another monthly Lawnscaping blog hop featuring the Facebook Inspiration Team! This month we are inspired by the color PINK! I think you will enjoy seeing all the fun projects along this hop! I also have a video tutorial on how I made my card as well! So be sure to watch!! You should have found your way to me by ISHA! I also want to give a shout out to our sponsor for our monthly hops which is Lara Smith from The Ink Road on Etsy. She has a wonderful shop filled with all sorts of crafty goodness! I decided to make a baby card - pink is afterall a great color for baby girls! And, you can never have too many baby cards on hand when you need one really quickly! 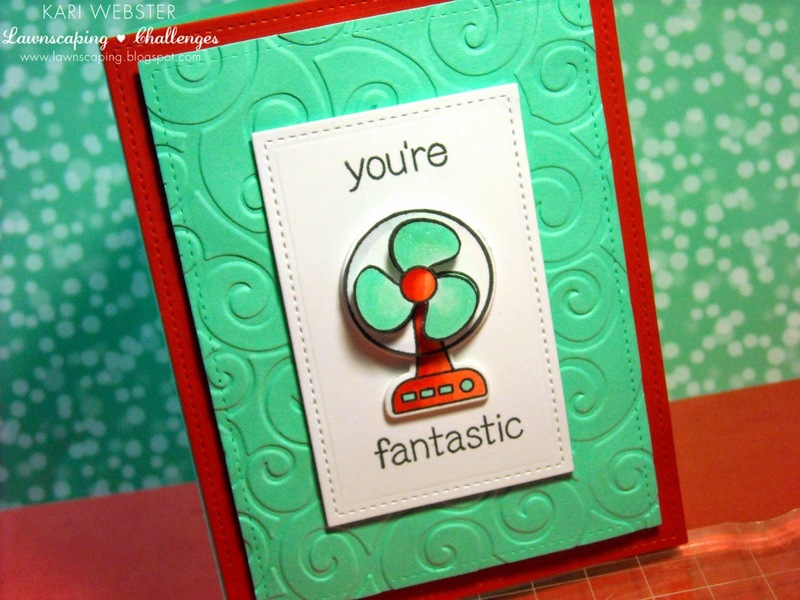 Like I mentioned before, I do have a video tutorial to share on how this card came together! And, that is below! I did a lot of die cutting for this card. I used the largest stitched rectangle die from Lawn Fawn, as well as the grassy border die, and a circle die. For my main focus, I used felt for my bunny images, and used the coordinating dies from the set Hello Baby - also from Lawn Fawn. I stamped my sentiment in Wild Rose ( Lawn Fawn), and I still do plan on doing a my personal review on these inks for my subscribers over at my channel on YouTube. I did a lot of "after thought" planning it seems for this card - but I think over all it came together pretty cute! What do you all think? Be sure to leave a comment below for your chance to win a gift certificate over at The Ink Road!! It is time to send you off to your next destination - Lenny! And, if you happen to lose track, here is a list of all the blogs on the hop in its entire order! 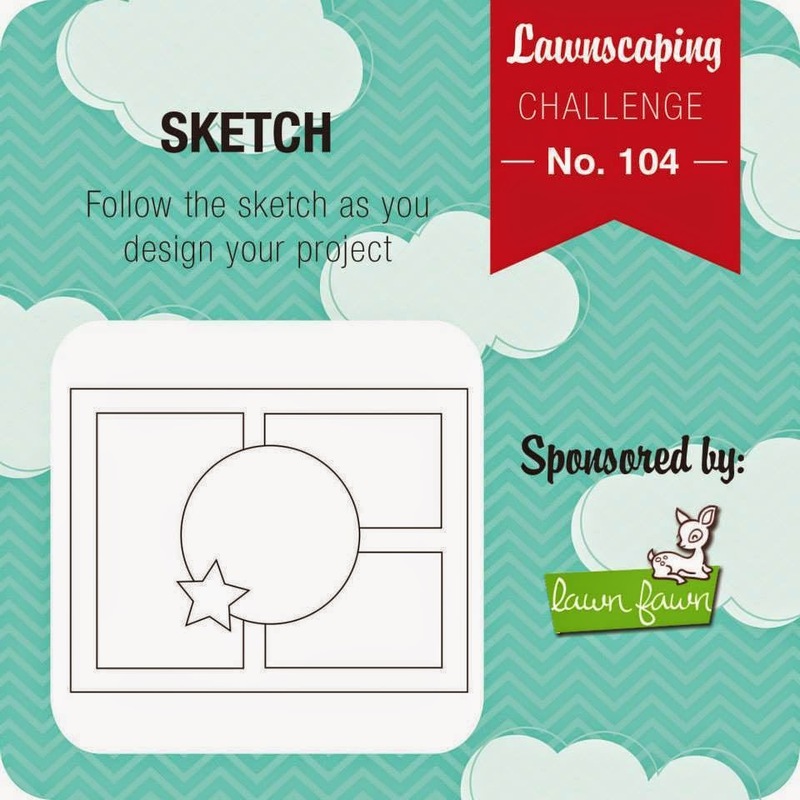 We are entering into a new challenge over at Lawnscaping, and we are testing your skills by working with a sketch. I will tell you right up front. I felt like I've never been good at sketches, but it is a good challenge, and really push my creativity. 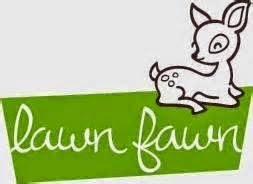 Annnndd, we have an awesome sponsor - the one and only Lawn Fawn!! The winner of this challenge will get a $25 dollar gift certificate and a fun badge to display on their blog!! WHOO HOO! My card, I kept it pretty simple - I took the star from the sketch and ran with it....I wanted a star themed card to go with the sketch. I used papers from the BeachSide 6x6 paper pad from Lawn Fawn, and I picked three colors with the star background. LOVE this paper! I also used my Stitched Rectangles dies to create the rectangle shapes on my card base. 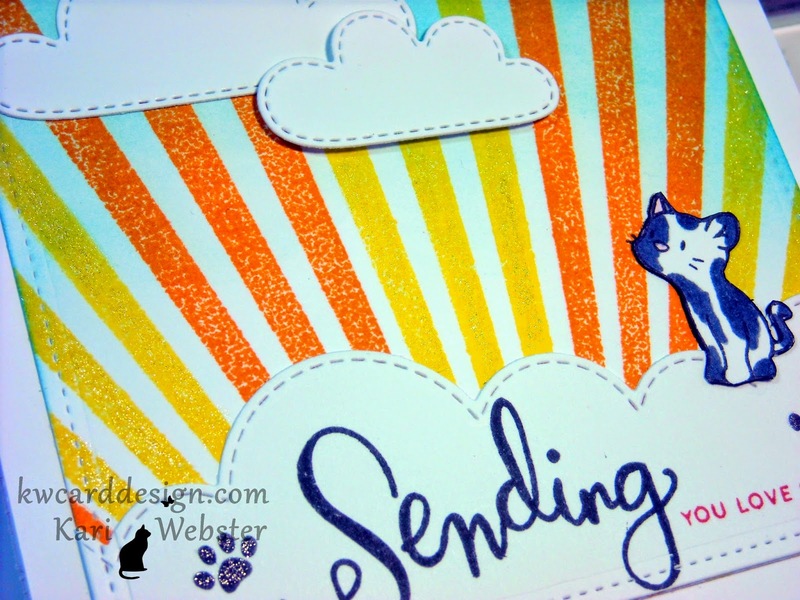 I used a star background stamp also on my Fog card base, and stamped the background to create a tone on tone effect. I used the stamp set Lucky Stars for my sentiment, and I heat embossed it in some Pewter embossing powder. Love this stuff too! SO pretty. And, check out that sparkle on that star. I took one of the wood veneer stars from Lawn Fawn and altered it by embossing it with some black sparkle embossing powder. When it is embossed, it doesn't look black at all, but it gives such beautiful sparkle!! I am glad my camera captured it!! I hope you are able to play along with us!! Thanks for stopping by!! Hi all! So I wanted to share another card/video with all of you. Today, I am playing with some Distress Inks. I love the unique properties that Distress Ink has when it reacts with water. Recently I made a card that was for the Lawnscaping Challenge : Distress Addicts. THIS is the card I made for that challenge. So, I wanted to revisit that technique, and do a video tutorial on it. I used the same distress ink colors Abandoned Coral and Cracked Pistachio, and the same background stamp from Argyle Backdrops from Lawn Fawn, but my I changed up the sentiment, and left off the twine. If I do say so, I think the first go 'round of this card as far as the background goes I like better, but that is the fun thing about doing this technique - you will never have the same outcome twice. For my sentiment - I used the stamp set that Lawn Fawn designed for Simon Says Stamp last September for their Stamptember event. Unfortunately, this set is no longer available for purchase, but I hadn't used this set but once ( in the video I said mistakenly said that I'd never inked it up ) and so I wanted to ink it up today for this card. So - if you'd like to see how I made this one from start to finish - I have the video below!!! Hope you all are having a great weekend!! Happy Saturday crafty friends!! 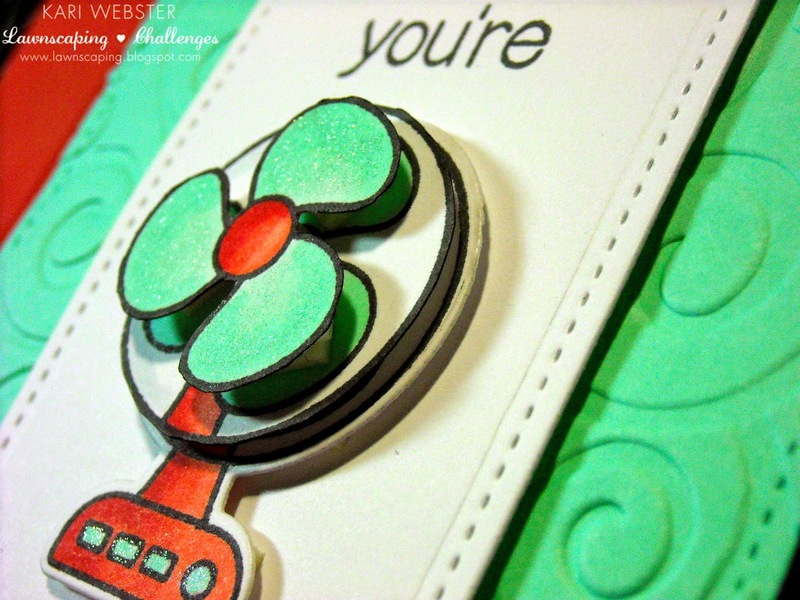 Today I am sharing a one layer card that features sentiment stamping for the background! I purchased the Mama Elephant set Tiny Heros and hadn't inked it up yet - so I wanted to do something a little different this go 'round with my stamps. So - I chose two of the sentiments to use as my background for the sentiment stamping, and two colors of Memento Ink -Lady Bug and Cantaloupe. 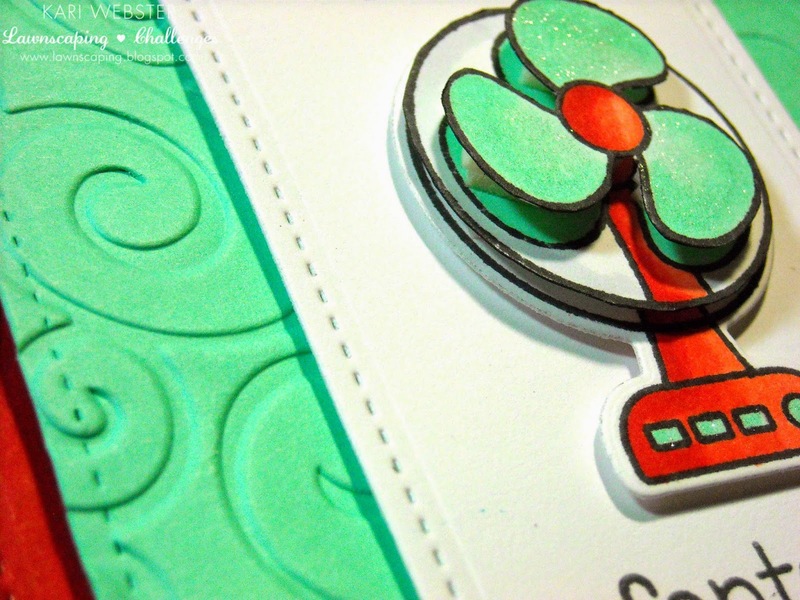 I created a 5 x 5 square card base, and I die cut an oval from a Stampin Up Ovals die set from some Inkadinkado Masking paper - and placed that as much in the upper center of my card base as possible. Then, I just started inking up my sentiments, and starting stamping. Once I was done with my stamping, I took some Salty Ocean Distress Ink and inked around the edges of my mask paper to really define the edge, so when I removed my masking paper, it would give it some fun dimension even though this was a one layer card. I then stamped one of the kid images from the same stamp set with my MFT Hybrid Black Licorice ink, and colored in the mask part and star. I really wanted to highlight those images to represent our "Super, awesome" this girl was! It was hard to not color in the entire image. I really wanted to do something different. I have the video tutorial below in case you wanted to see how I made this card from start to finish. Enjoy your weekend, and I'll be back soon!! Thanks for taking the time to stop by! Hi all!! 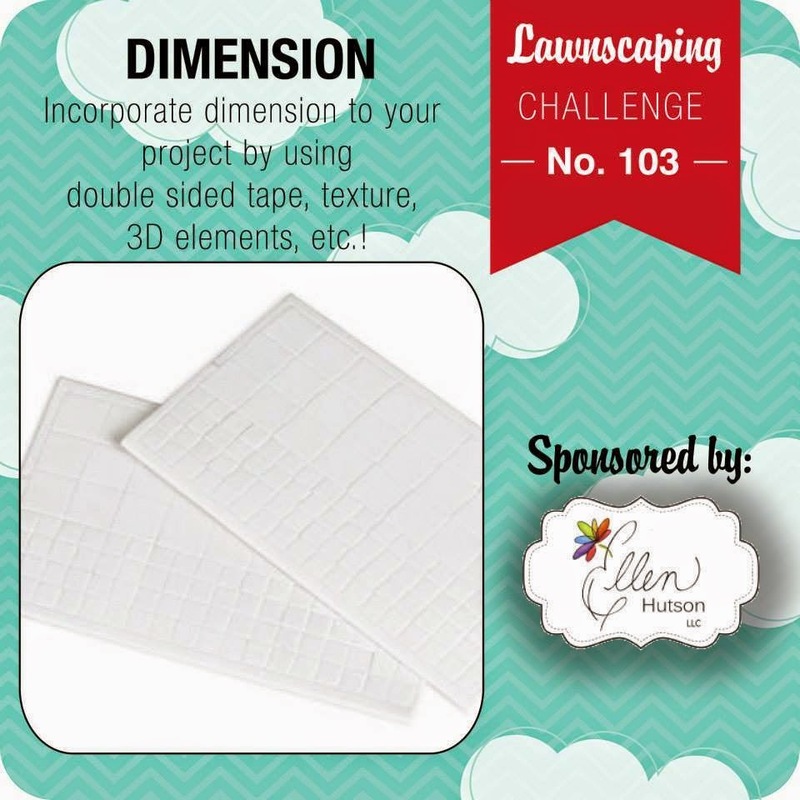 Welcome to a new challenge over at Lawnscaping Challenges! We are all about Dimension this go 'round! Who doesn't love dimension. It makes you cards or layouts just stand out! I really wanted to capture that in my card for this challenge, and I hope you feel that I achieved just that!! So - I kept the design pretty simple. I wanted the dimension to speak for itself. I inked up the cute fan image from Best Pun Ever from Lawn Fawn. I think this is an adorable set!! I first started stamping out my fan image three times and coloring one of the images in its entirety, and then color only parts of the other two images as I was only going to use parts of them. I also wanted a "retro" feel with the color scheme. I used my Copics to color in the fan(s) and then I fussy cut my images out except for the "full" fan that I colored. Here I am showing you more of that dimension. Loved how these photos really show it off! To create the dimension, I used two different thicknesses of foam adhesive. And, as you can see I wanted some texture too on my card, so I used an embossing folder that represents "wind swirling" and I used the de-bossed side. For my panels I used both the Small Stitched Rectangle Stackables and Large Stitched Rectangle Stackables. And, of course to adhere all of my elements, I used more foam adhesive! I also added a bit of shimmer to my fan's blades with Clear Wink of Stella brush pen. 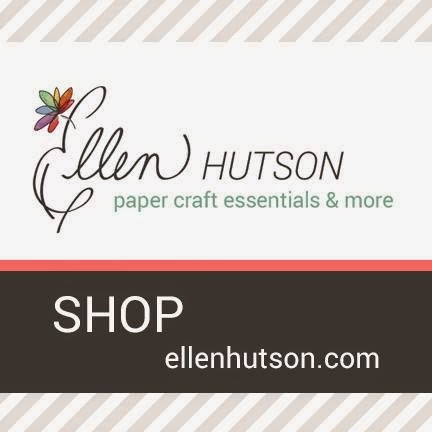 I hope you are able to play along as there is a chance to win a $25 gift certificate with Ellen Hutson!! Catch you back here soon!! Personally, the loss of Mannie affected me more than it probably should for the simple fact that I don't personally know Kristina in "real" life, but trust me when I tell you that the Good Lord gave me a sensitive heart, especially when it comes to things I hold dear like furbabies, they tend to affect me in some form or fashion. It affected me hard because I have two cats of my own that I hold precious and dear to my heart. They are my "children" as I do not have any of my own. The week that Mannie got sick, and then passed, I was dealing with the sickness of my cat Katie. It wasn't nearly as a serious condition as Mannie, which I was thankful for, but I didn't know what do to for my girl outside of taking her to the vet, which I did. Now I know this blog post isn't centered around me or my fur babies, but I wanted you to know where I was coming from when I made this card. I wanted Kristina to feel that she was loved by me and felt support of what she was going through, and the best way possible that I felt I could do that ( other than a donation in Mannie's honor which I did do) was to make her a card. That is how Kristina came into my life as probably she did with most of us - crafting. Now I am sure I am not the only one of her fans that will and have sent her a card, but I just felt compelled to share mine with you - my blog readers and followers. 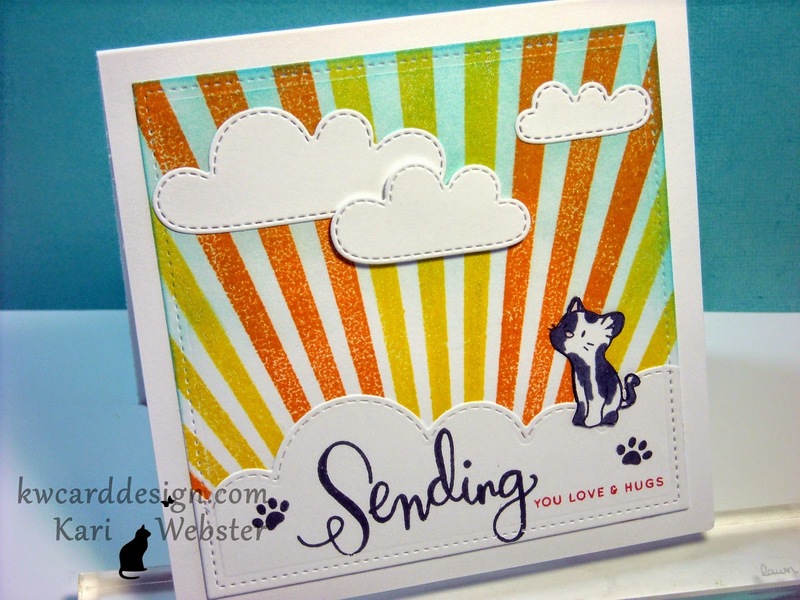 As you see, this card represents Mannie in a happier place( and not hurting) - the sun is shining, which means this kitty is in the ultimate place to "sunbathe" - over the rainbow bridge. I hope she has received it, and likes it. And, I hope she feels that love that I so want her to have through her grieving period without her buddy, Mannie. Kristina - on the off chance you are reading this - I send you much love, and wish for you one day that you will be able to be in a place in your heart that you can give love to another precious kitty like Mannie - because you were the best thing that happened to him, and I KNOW he knew that. Thanks for taking the time to read a more personal blog post from me today! See you all soon!